I participated in a campaign on behalf of Mom Central Consulting (#MC) for Monk Fruit In The Raw. I received a promotional item and product sample as a thank you for participating. Here is a tasty recipe just in time for the New Year celebrations. 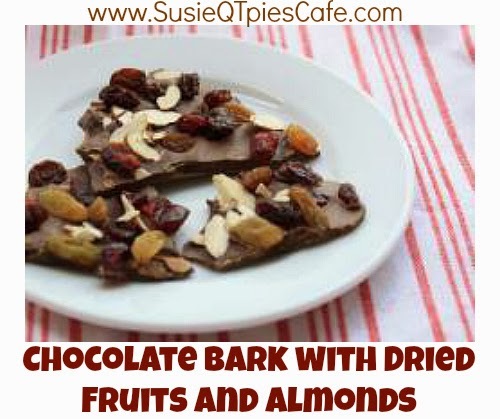 This Chocolate Bark with Dried Fruits and Almonds recipe is sweetened with Monk Fruit In The Raw which is a wholesome, zero-calorie sweetener. Monk Fruit is a vine-ripened fruit native to South East Asia. It can found in packets and Bakers Bags. IF you are looking for a reduced sugar and lower calorie option to kick off the new year this one has wholesome ingredients, taste great, no sugar alcohols and you'll feel good about using this for your family. Here is one recipe to give Monk Fruit In The Raw a try. Check out this recipe and more, HERE. Line a baking sheet with baking parchment. In a bowl, combine the almonds, cranberries, and raisins. Using a metal or a flexible spatula, spread the Monk Fruit In The Raw™ -sweetened tempered chocolate in a roughly 8-inch x 12-inch x 1/4-inch layer on the prepared baking sheet, smoothing to even it. Sprinkle the dried fruits and nuts evenly over the chocolate. Set the Bark aside until the chocolate sets firmly, 2-3 hours. Gently lift the bark off the baking sheet, using your fingers to break it into pieces of varying size. Place the pieces of Bark in an airtight container, or a decorative gift box, using wax paper to separate layers. Chocolate bark can be made with melted chocolate that is not tempered. To harden, chill the bark until the chocolate is firm, and serve it directly from the refrigerator. The chocolate may look cloudy or streaky and will melt quickly in your fingers, but the bark will taste as good as when made using tempered chocolate. 3 tablespoons cacao nibs, 3 tablespoons unsweetened shredded dried coconut, 1/4 cup chopped dried apricots, and 1/3 cup chopped dried mango. To make candy bars, pour the tempered chocolate into plastic molds, then press dried fruits and nuts into the exposed surface of what would normally become the bottom of the bar when it is unmolded. Wow for a 'health food' this actually sounds really yummy. I love any dried fruit, including cranberries and raisins. I'll have to try it! OMG the tropical bark looks good! I love anything with coconut in it. I like the idea of having a lower sugar content. I eat a lot of dried fruits and yeah they can sure get up there on the sugar scale. Yum, this looks good and healthy. I think my kids would enjoy this for we love dried fruit. This recipe sounds fantastic! Can't wait to try it out - thanks for sharing! Everything looks so scrumptious! Especially the Oreo Balls...yumminess! I can't wait to try the recipe for the soft pretzels. My hubby loves them, and has been looking for a good recipe to try so we can make them at home. Thanks so much for sharing!